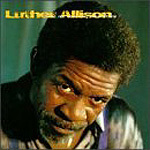 CD review: "Hand Me Down My Moonshine"
Now living in Paris, blues guitarist Luther Allison has released what may be his finest album. An all-acoustic set, the European release "Hand My Down My Moonshine" features thoughtful picking and incredibly soulful singing matched with some great songs. On most of the cuts, Allison is backed only by an acoustic bassist named Zox. On the last track, he's joined on acoustic guitar by his son, Bernard Allison  and they feed off each other for some incredible solo swapping. Allison's songwriting remains strong, with all but two of the tunes here from his pen. Not all are strict blues  but that's been true throughout his career. "Castle," for instance, is as much rock as it is blues, but Allison's vocal inflections, bent notes on guitar and general approach to playing give it a very bluesy feel. Those familiar with Allison may be surprised to find him in an acoustic setting. He has always been on the forefront of musical technology, with wah-wah pedals and other effects boxes. But on this acoustic outing, Allison shows just how many different sounds one can get from an acoustic instrument. Fans of acoustic blues especially are going to dig this album. Despite its relaxed feel, Allison's playing is as impassioned as ever and his vocals soar.